Super Nova? Talented Young Righty Bursts Upon the Scene, but Who Is on the Way Out? After yesterday’s 9-5 victory over the Mariners, the Yankees surrendered to the inevitable and placed Alex Rodriguez on the 15-day disabled list. To take Arod’s place on the roster, the Yankees also promoted 23-year old right hander Ivan Nova, who was 12-3 with a 2.86 ERA at triple-A Scranton/Wilkes-Barre. Ivan Nova will make his first major league start on Monday, but does that spell the beginning of the end for someone else? 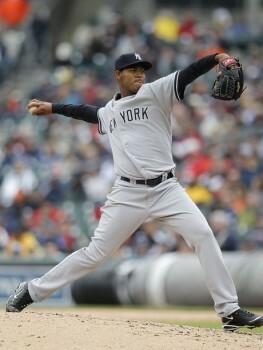 Considering the plight of the Yankees’ starting rotation, Nova’s promotion has been long overdue. However, at least initially, it doesn’t look as if the Yankees have any concrete plans for their talented young right hander. Instead, the team seems prepared to have Nova make his first major league start against the Blue Jays on Monday, and then play it by ear. If Nova does not pitch well against Toronto, he’ll likely be sent back down to Scranton until at least the September 1 call-up date. If he has anything resembling a competent outing, however, he could be in the rotation for the foreseeable future. The next question, of course, is whom then would he replace? In his initial postgame comments, Joe Girardi was very non-committal about his plans for both Nova and the rotation as a whole. According to the Yankees’ manager, Nova is in, but nobody is out. Unless the Yankees go with a six man rotation, which is highly unlikely, something has to give. Below are the Yankees’ options, which are curiously many for a team with the best record in baseball. When Andy Pettitte first went on the disabled list, there was initial speculation that the Yankees would turn toward Nova. Instead, Girardi opted for a reprise of last year’s failed experiment by naming Sergio Mitre as the interim replacement. That experiment lasted only one start this time around, however, as Dustin Moseley assumed Mitre’s role immediately thereafter. In his five starts since then, Moseley has gone a respectable 3-2 with a 4.97 ERA, but has shown a propensity for giving up the long ball. Also, with the exception of one start against Toronto, in which he yielded five runs over 7 1/3 innings, Moseley has started against relatively weak offenses, which doesn’t portend well as the Yankees enter a prolonged stretch against stronger competition. Because Moseley was scheduled to pitch on Monday, the decision to start Nova in his place seems like a straight up switch. The Yankees have gotten about as much as they could expect from Moseley, so making the move to Nova would be like quitting while ahead at one table to roll the dice at another. At 28, Moseley’s potential is pretty much limited to how he has performed to this point, so going with Nova would not only give them a higher ceiling of expectations, but also provide an early preview that could come in handy when constructing the 25-man roster during the offseason. Although an exact limit has not been set (at least no publically), the specter of the “Hughes Rules” has hung around the Yankees all season. Otherwise, at 15-5 with a 3.90 ERA, Phil Hughes certainly would not be a candidate for removal from the rotation. However, Hughes also has 140 2/3 innings under his belt. If he was to make all of his starts down the stretch, Hughes would still have eight remaining, which at six innings per outing would amount to approximately 48 innings. The rumored innings limit has been in the range of 170, so unless Hughes is skipped at some point, he is more than likely going to shoot past that parameter. Using Nova to take the place of Hughes would certainly accomplish the goal of reigning in his innings, but it wouldn’t be in the best interest of the team’s championship aspirations. Hughes has re-emerged as the Yankees second best starter, having rebounded from a midseason lull to go 4-2 with a 3.63 ERA over his last six outings. Quite frankly, the Yankees can ill afford to lose Hughes’ production. At this point, the team has no choice but to leave Hughes in the rotation, so it isn’t likely that the Yankees will be swapping one young right hander for another. After a rough first six weeks, Javier Vazquez turned his season around, going 8-4 with a 3.11 ERA in 14 games from May 12 to July 26. More recently, however, Vazquez’ season has taken another turn, but this time for the worse. Culminating in yesterday’s debacle against the Mariners, Vazquez has gone 0-2 over his last five starts, including an ERA of 7.43 in only 23 innings. Even more concerning, Vazquez has surrendered eight home runs and been hit to the tune of a 1.101 OPS during that span. Adding injury to insult, Vazquez has also complained about a dead arm that has robbed him of his velocity. Not only has he expressed concern between starts, but while on the mound, he has looked reticent to attack the strike zone. If anyone could use a break, Vazquez seems to be the ideal candidate. Also, it is important to remember that while with the Yankees in 2004, Vazquez allegedly pitched down the stretch with a sore shoulder. In 10 starts over the final two months of that season, Vazquez went 2-4 with a 6.75 ERA. If this is an example of history repeating itself, the Yankees would be wise to heed the warning. Although you can understand the Yankees desire to see how Nova performs on Monday before making a permanent decision, the team can not afford to be indecisive. For at least the next two games, the Yankees inability to be firm will force them to play with a depleted bench, a problem exacerbated by the much too frequent presence of Francisco Cervelli and now Eduardo Nunez/Ramiro Pena in the lineup. Regardless of how well Nova does on Monday, the Yankees would be wise to DL Javier Vazquez and promote a bat (maybe Jesus Montero?). Not only would it provide Nova with the comfort of a three-start audition, but it might give Vazquez the rest needed to re-establish himself over the final month of the season. The worst decision the Yankees could make is to allow Monday’s start to determine the rotation’s fate. The playoffs are not a given, so it’s time for a more proactive response to the lingering problems that threaten another championship run. I like the idea of putting Javy on the DL, esp. if he indeed does have a dead arm. If they bring up Montero will they be able to provide him enough at-bats to stay sharp? Does that matter? Do you know or think the Yankees will be open to letting Hughes goe past is innings limit? They could definitely find enough ABs for Montero with Arod down, but for some reason Girardi is in love with Cervelli. Besides, Montero has almost played a full triple-A season, so losing a couple more weeks in the minors wouldn’t retard his development. As for the innings limit, I think the Yankees may have no choice but to back of it a little. That’s probably one reason they haven’t made the “rules” public. Alot will depend on the standings and the health of Andy Pettitte.